You’ve got to hand it to Ryan Murphy: Love him or hate him, he never gives you quite what you expect. The first season of his FX anthology series American Crime Story (not to be confused with Murphy’s other anthology, American Horror Story) was an acclaimed ten-part look at the O.J. Simpson criminal trial that examined the subject matter from multiple perspectives, including those of the defense, the prosecution, and the jury, and illuminated the case’s wider context while allowing its central character, Simpson, to remain an enigma until the end. 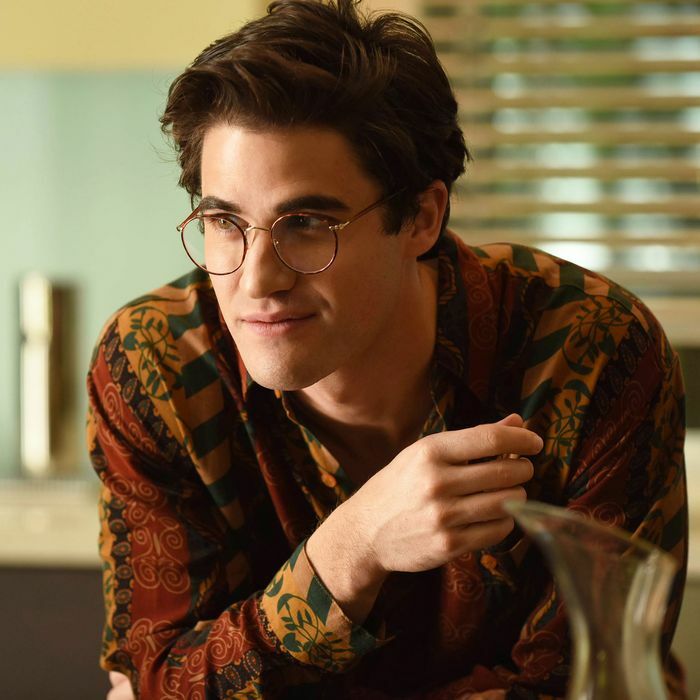 Season two, The Assassination of Gianni Versace, about the titular fashion designer’s murder by a serial killer, does all of those things, more or less (including the enigma part) while swapping in homophobia, AIDS, and gay rights for the first season’s focus on racism, sexism, and police misconduct. But the tone, the pace, the feel of the season are all quite different. Adapted by novelist and London Spy screenwriter Tom Rob Smith from a 1999 nonfiction book by Maureen Orth titled Vulgar Favors: Andrew Cunanan, Gianni Versace, and the Largest Failed Manhunt in U.S. History, it prizes atmosphere, characterization, architecture, and, yes, fashion over traditional storytelling virtues. It doesn’t attempt anything like the intricate structure of the O.J. season, which was as meticulously organized as a good lawyer’s evidence files, but it’s not disorganized, either. If anything, the structure of this one is much simpler, built around a conceit that has a certain poetry: We start with the murder and work our way backward chronologically, à la Memento or Irreversible. The pilot, directed by Murphy in a series of gliding, faintly sinister long takes, starts by introducing Versace (Édgar Ramírez), his longtime partner Antonio D’Amico (Ricky Martin), and his soon-to-be-killer Andrew Cunanan (Darren Criss) in Miami on the day of the fashion designer’s 1997 murder, and builds inexorably to Cunanan shooting Versace to death outside the gates of his mansion. (The cinematography, by Murphy’s regular director of photography Nelson Cragg, is exceptional, using very wide-angle lenses to abstract the lines, colors, and shapes of rooms, hallways, building exteriors, and landscapes, so that you appreciate them as you might a suit or dress.) From that point on, the story moves according to its own slowed-down rhythms, choosing to focus its attention on people and events that might seem unconnected to the Versace murder until it dawns on you that you aren’t watching a procedural, or even what certain news outlets call an “explainer,” but something more like a psychologically oriented nonfiction novel — one that uses a combination of careful research and blatant dramatic license to speculate on why real people did the things they did, and how some of them ended up crossing paths in the first place. And yet — odd as this might sound — Cunanan ultimately works rather well as a kind of storytelling device, moving the tale backward through time, and all over the continental U.S. This strategy won’t be to everyone’s liking, and I won’t pretend that it works like gangbusters all the time. But it’s a valid storytelling approach that’s been used in everything from Robert Bresson’s Au Hasard Balthazar to Steven Spielberg’s War Horse, and it gives Murphy & Co. a pretext to spend quality time with other Cunanan victims who weren’t particularly famous, which is opposite of what productions like this usually do. The cast of characters who are each granted the equivalent of their own short film includes closeted real-estate developer Lee Miglin, touchingly portrayed by former M*A*S*H star Mike Farrell, and Jeff Trail (Finn Wittrock), a former Navy lieutenant driven out the service by institutional as well as personal bigotry. Although it’s regrettable in some ways that it took the story of a gay serial killer to create the framework for a series of sketches about gay men of different ages and social classes (all white except Cunanan, who was half-Filipino), it’s also remarkable to see a major cable drama devote one-and-a-half episodes to somebody like Trail, an intriguingly complex noncelebrity who defended a fellow gay sailor from two homophobic attacks, cut a tattoo off his own leg to prevent investigators from using it to identify him in one of their witch hunts, and ultimately resolved to move away from San Diego because the sight of Navy ships in the harbor was breaking his heart. Throughout, the variety of locales is more wide-ranging than could’ve been anticipated: Besides ‘90s-era Miami, we briefly visit San Francisco, San Diego, Los Angeles, Minneapolis, Chicago, New York City, and Pennsville, New Jersey, and the fetishistic production design and costuming consistently nail the little details that help sell a moment, from the high-waist, stone-washed jeans Cunanan sometimes wears to the blocky TVs and computers in every home, apartment, and office. And even when the story spends more time marinating in a subplot or scene than its dramatic content might justify, you can be confident that if you just stick with it for another five or ten minutes, there’ll be a scene unlike any you’ve ever encountered, like the flashback to a victim’s childhood that shows him going on a hunting trip with his father, running away in horror after the old man shoots a duck, then being consoled rather than chastised afterwards, and sincerely assured that hunting is “not for everyone.” The Assassination of Gianni Versace isn’t for everyone, either, but it’s sincere and committed as it follows its own path. When you get to the end, the reversed storytelling could seem sad, because you’re thinking about the inevitable tragedies to come, or restorative, because the dead have been systematically resurrected and have at least a bit more living to do.